Ashley Haigh (left) welcomes Rhys Griffiths, of Venture Learning, to the company’s new education centre in Nottingham. A company providing bespoke alternative education facilities for children facing permanent exclusion from mainstream schools has launched a new centre in Nottingham. 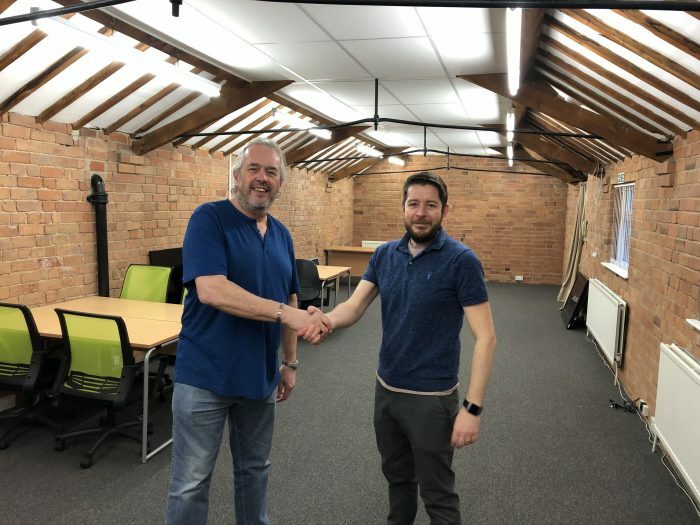 Venture Learning has signed a five-year lease on the centre at Forester Street, Netherfield, in a deal brokered by national commercial property consultancy Lambert Smith Hampton (LSH). Landlords Ashley and Marilynn Haigh, who run Forester Flooring Company and Carpet Tile Wholesale at the same site, agreed to a change of use of a vacant building and helped transform the property with a substantial scheme of improvements. Ashley said: “Venture Learning came forward with a proposal to change the use of the building from offices to a training centre for their new business providing alternative education for children aged between 11 and 14 in the local area. The process to obtain a change of use was complex but eventually approved and we transformed the property into an environment suitable for the tenant. Rhys Griffiths, head of provision at Venture Learning, said: “The number of pupils at risk of permanent exclusion from mainstream schools is increasing. Our provision provides a bespoke educational experience which aims to rebuild pupils’ confidence and re-engage them with their learning.